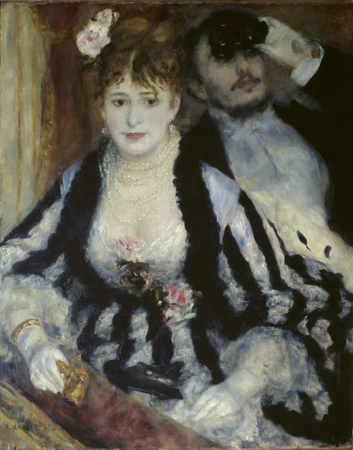 Eva Gonzàles must have captivated Manet, at that time the most controversial artist of his day. They met in 1869, introduced by the English artist Alfred Stephens, shortly after which Manet accepted her as his first and only student. He was approaching forty and with her admiration and eagerness to learn from him, it would have been hard for him to resist. Just as appealing, though, were her family connections. Her father Emmanuel Gonzàles, a noted journalist and writer was president of the Société des Gens de Lettres and Manet, who was still struggling to gain Salon recognition might have felt he needed the protection and support of just such an establishment figure. 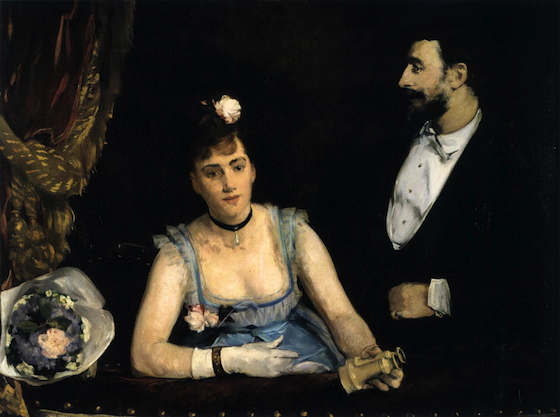 And then, of course, she was also Spanish and Manet was one of Paris’s most notable Hispanophiles. After her apprenticeship, the two remained friends and correspondents for the rest of their lives. Sadly, they died within three days of each other; first Manet from syphilis and then Gonzàles aged 34 after childbirth. It is said that when news reached her sickbed of her old master’s death, she sat up and weaved a garland of flowers for his grave. Despite, or perhaps partly because of this touching tale of devotion, much of what has been written about her as an artist and indeed as a character seems somewhat dismissive. The problem, it seems, is that she was just too good a student. But then what about Artemisia Ghentilleschi? The first great woman artist, also known as La Donna Caravaggista (the woman follower of Caravaggio). To follow a master is not necessarily a bad thing. More to the point, perhaps, is who she was up against at the time; this was, after all, the age of Mary Cassatt and Berthe Morisot, beside whom Gonzàles’s work does seem somewhat tame. Still, while it is true to say that she is not an artist of the first rank, her few surviving works are nevertheless both beautiful and intriguing and in the case of her most famous, A Loge at the Théâtre des Italiens, offer an alternative view on a world that has largely been colored by our encounters with more famous, largely male artists. Framed by the lush red velvet and gold rope tassels of the curtain and a slightly curving hand rest, the artist’s sister Jeanne Gonzàles sits accompanied by the standing figure of Henri Guérard, the man whom Eva would later marry in a box at the Théâtre des Italiens, the venue for the grandest of opera productions by the likes of Mozart, Rossini and Verdi. 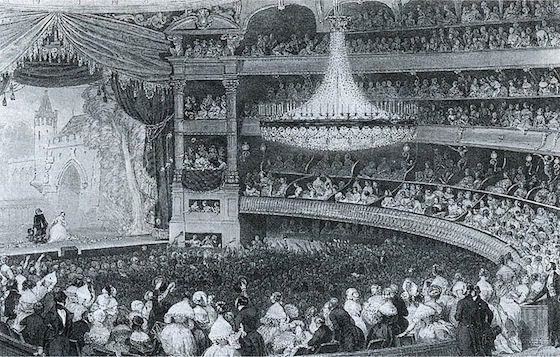 A lithograph of the theatre from 1843 shows not just the popularity of these performances, but also how close the curtained boxes, such as the one the painting shows, were to the stage as well as how exposed those that occupied them were to the gaze of the public. The couple appear detached, the man in profile, the woman posed frontally staring ahead of her, a large pair of opera glasses in one hand. Her expression seems at once alert and relaxed, suggesting that sort of entranced look one has when watching an opera. A particularly spine-tingling aria is being sung perhaps and Jeanne, her hands lowered, simply listens. Perpendicular to her, the man leans back, his elbow resting on the velvet covered rest, his body language expressive of the poise and detachment of the flâneur. The subject of the loge, or theatre box, was one that was favored by the Impressionists. Aside from the natural frame the box supplies, it also offers opportunities to explore some interesting themes such as the relationship between artifice and nature, appearance and reality and of course the near universal concern of Impressionist artists, the spectacle of modern life. In a space at once public and private, the sitter is conscious of both watching and of being watched, a phenomenon that was a key feature of nineteenth-century Parisian life in which the streets themselves became like a stage and the passers-by actors on it. In the loge, however, one is removed from the chaos of the crowd and taken to a far more privileged space. Given these associations with wealth and status, the subject might well have appealed to the aspiring bourgeoisie and a canny artist would certainly have had a sale in view when producing such an image. Another feature of the loge is its ability to imply metapictorial narratives—events that are taking place outside of the picture frame. The directions of the gazes of two figures is in this sense certainly curious. Imagining the loge to be slightly to the left of the stage, Jeanne’s eyes are clearly leveled at the performance, while Guérard’s, on the other hand, follows the opposite direction. What is it that he is looking at? The audience perhaps, or possibly, given that it was common for the doors to these theatre boxes to be opened, even during a performance, and for social activity to take place in the corridor outside them, perhaps some event or spectacle taking place there, off-offstage as it were, has captured his attention. Knowing who the models are is useful. Guérard being Eva’s beau and not Jeanne’s, we can reasonably discount the possibility that they are romantically involved. It is also useful to note that at this time a woman of Jeanne’s class would not be seen out alone. Instead, so as not to compromise her respectability, a member of the family or a trusted friend would accompany her, acting as her chaperone. Perhaps it is for this reason Guérard remains aloof, keeping his distance from perhaps the underlying purpose of Jeanne’s presence in the theatre, namely, as a young woman of marriageable age, a débutante, she is formally presenting herself to society. Though very much in her element, as one would expect from the daughter of a celebrated writer, clearly a great deal of thought has been taken in how best she can offer the image of herself to the public. The flowers that face us and which offer a perfect match to the dress and accessories she wears suggest this sense of ritualized display while the chair next to her is empty, signaling perhaps her availability. What a contrast then to Renoir’s La Loge, painted in the same year. Here the model, a working-class girl called Nini, has been dressed up by the artist in a far more lavish fashion. Dripping ermine and pearls, she is placed conspicuously in the front of the box, her purpose it seems being little other than decorative—a trophy or adornment for the man behind her who looks up with almost grotesquely large binoculars. The understatement of Gonzàles’s work, on the other hand, with its Manet-esque economy of expression, exudes elegance and refinement and, indeed, just the sort of poise and detachment that characterize the dispassionate gaze of the flâneur. In it we discover a slice of Parisian life that is presented in ways that record in a more sensitive and nuanced way than Renoir, I think, the manners and mores of the time. Cite this page as: Ben Pollitt, "Eva Gonzàles, A Loge at the Théâtre des Italiens," in Smarthistory, August 9, 2015, accessed April 21, 2019, https://smarthistory.org/eva-gonzales-a-loge-at-the-theatre-des-italiens/.